Laser technology is an important key to letting CO2 emissions be reduced in passenger cars. A multitude of laser-based innovations in automobile production contributes to achieving this goal. The following article provides an overview. Coming generations of vehicles will be far lighter than their predecessors. Laser-based manufacturing processes play an important part in this progress. 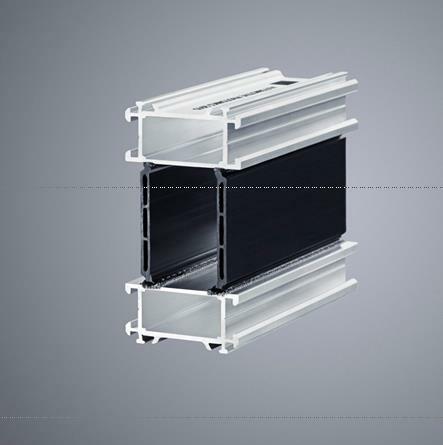 Examples include parts without flanges, the increasing use of aluminum, CFRP and other high-performance plastics, thermoforming and joining plastics to metals. All these innovations help to reduce vehicle weight, in turn extending the cruising range and shaving CO2 emissions. When joining sheets with conventional spot welding it is necessary to overlap the edges. By comparison, welding with a laser beam makes possible flangeless designs. Here the individual sheets are first assembled by way of tongue-and-groove joints and then welded by the laser. This offers several advantages: processing time drops when compared with spot welding; the elements thus joined can be of differing materials and thicknesses; the resulting structures have no redundant material and thus save weight. In addition, the prepositioning of the parts one with another reduces the – otherwise enormous – effort for clamping technology, permitting simple and cost-favorable clamping aids. Non-flanged structures, when compared with conventional spot welding, offer many benefits in regard to processing time, material use and the weight. Where greater loads demand additional stability, reinforcing structures can be attached as needed. The corresponding structures – such as the underbody of a vehicle – can be made up with less tooling. Neither are any special tools required for this purpose, which have to be manufactured in an elaborate process when preparing for production. Instead, all the required steps in processing can be carried out by a standard laser welding robot. One outstanding example of this process is the “StreetScooter” deployed by the German Post Office. It was engineered by an academic spin-off of the Rhenish-Westphalian Technical University at Aachen, Germany, and is built on an underbody made up without flanges. At present about 40 of these microvans are in trial use, which has been thoroughly successful to date. CFRP – carbon fiber reinforced plastic – is also being used more frequently in lightweight vehicle engineering, especially in vehicles powered solely by electricity. Laser technology also offers clear advantages when cutting and processing materials like this. In this way the incisions are made without touching the material or exerting any force whatsoever, ensuring that the shape and structure of the material remain unchanged. This eliminates all risk of warping, even in non-reinforced materials. Depending on the production process being used, cutting and processing can take place either before or after the CFRP parts have been shaped. When cutting blanks from carbon fiber materials, TRUMPF offers the laser systems in its TruFiber series; spatially shaped, 3D parts can be cut with the TruDisk beam sources made by TRUMPF. If CFRP – or a glass or carbon fiber mat already embedded in the binder – is to be cut, then the TRUMPF TruFlow series is an excellent choice. Here the laser melts away the fibers cleanly. 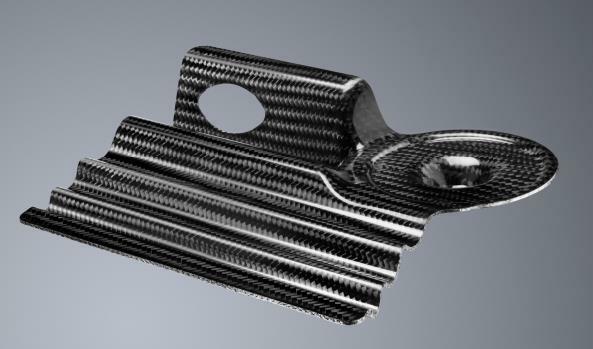 Carbon fiber reinforced plastics can be cut with the laser either before or after shaping. 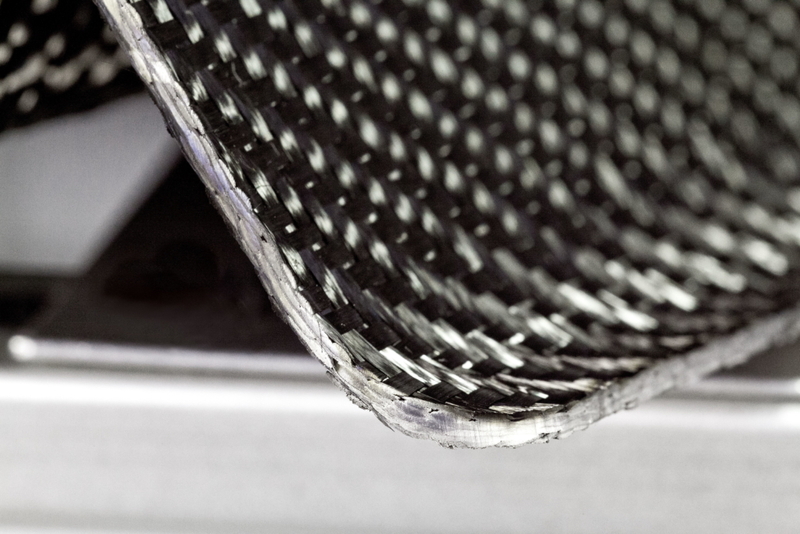 If desired, the pure carbon fiber mats can be cut prior to or after filling with the binding polymer. 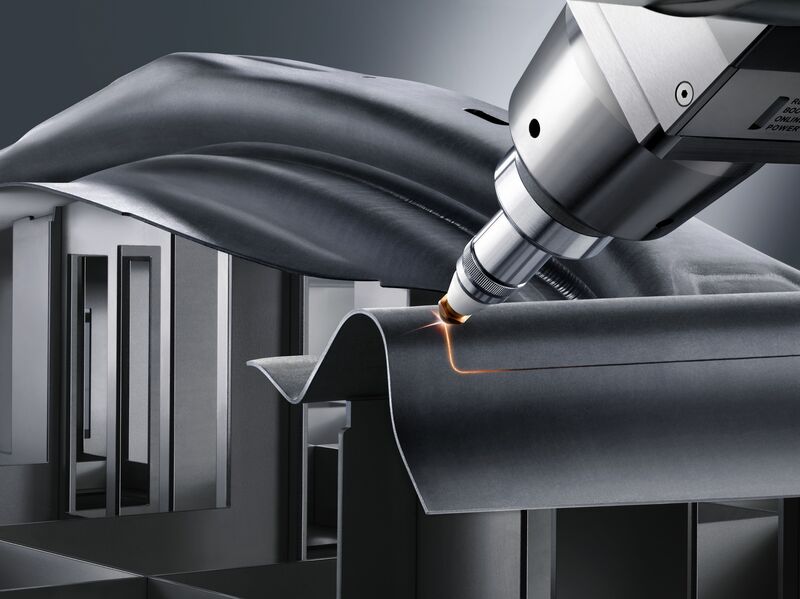 Cutting a hardened CFRP part: for materials less than four millimeters thick, the laser works two to three times faster than a water jet or milling tool and produces a higher-quality cut. Laser light enables woven parts to be smoothly cut to near net shape. No finishing work is required for the cut edges. A further way to improve the production processes using laser technology is thermal joining of plastics to metallic materials – without the use of adhesives. Since metals and plastics have widely differing melting points, this would not be possible with traditional welding technology. 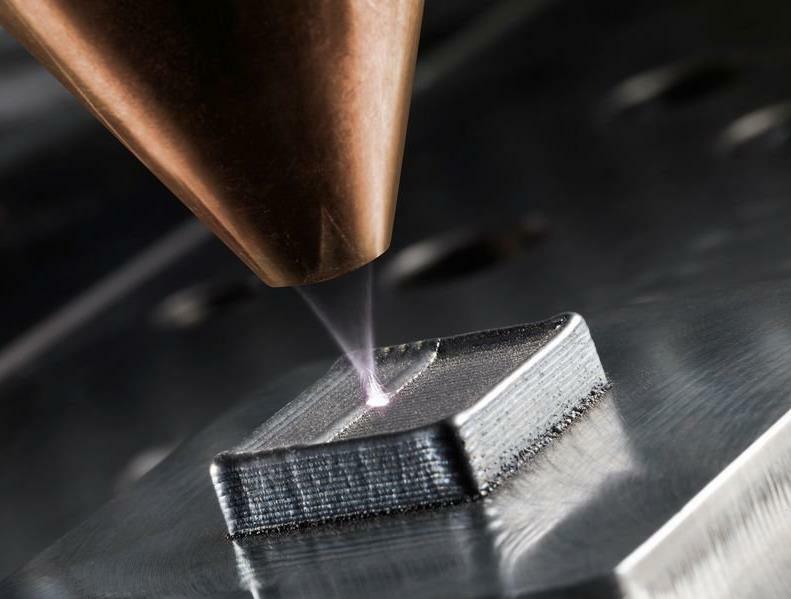 Using a short-pulse laser makes it possible, however, to create a defined pattern of undercuts in the metal, into which the heated partner, made of plastic, is pressed. Once the plastic has cooled and hardened, the two materials are joined by a form-fit connection. Examinations of the tensile strengths in such connections show that the union once again attains the strength of the basic material. Connections made this way are pressure-proof and waterproof and remain stable even under dynamic loading. Securely joining metal and fiber composites: an ultra-short pulse laser creates an undercut in the metal part, ensuring that the polymer and hot metal fuse together properly. Hot stamping processes allow for considerable reductions in the weight of body parts. However, the hardened steels are too strong to be cut in a press. Laser technology presents an elegant solution for this problem, too. The parts are cut out by 3D laser cutting, without wear and without applying force. This tremendously productive technology can also be used for 2D cutting of the feedstock material prior to its being shaped in the press. Here optimized cutting patterns can save material. If model facelifts or derivatives require subsequent modifications, these can be effected simply by reprogramming the laser robot. No new punching tools need to be engineered and manufactured. Conversely, laser light can also be used to induce partial softening to improve the formability in a closely defined area or to reduce the hazard of the material becoming brittle or breaking. The RF generators in the TruHeat series offered by TRUMPF are ideal for this purpose. The beam of a laser can also be utilized to remove coatings from areas in the steel sheet in preparation for later welding. In other words, ablating an aluminum-silicon coating 10 to 25 microns thick. The process can be regulated so finely that the amount of aluminum remaining is adjusted exactly, enabling precise control of the material properties. The laser systems used here, such as the TRUMPF TruMicro series, can undertake the ablation described here with a velocity greater than 30 meters per minute. 3D laser cutting makes it possible to cut parts without wear and without applying force – and at high productivity. In the following phases in the work, lasers can also apply lettering, marks, QR codes and the like. And lasers also serve to subsequently weld parts prepared by thermoforming. Even other approaches are offered by the techniques known as laser metal fusion (LMF) and laser metal deposition (LMD). Both processes are based on concepts such as those made familiar by 3D printing and additive manufacturing. They make it possible to produce parts that could not be manufactured at all with conventional processes. Complexity is free. This is true both in regard to their shape and in regard to the properties of the materials, especially since these innovative processes even permit combining differing materials within a single workpiece. In laser metal fusion (LMF) an extremely fine metallic powder is applied uniformly to a metallic substrate and then melted or fused selectively with laser energy and allowed to harden. When using this process to create a workpiece, the 3D engineering data are “sliced” into individual layers 20 to 100 microns thick. The 2D image of each layer is the basis for the additive build-up of the workpiece. Exact control of the laser makes it possible to fuse each new layer of powder to the layers below – at the desired places and at the required material thickness. In the case of laser metal deposition (LMD), the laser beam generates a weld pool on a metallic substrate, into which another material such as titanium, nickel, cobalt, tungsten-carbide or steel alloys is introduced as a powder. The powder melts and forms a layer which then coalesces with the substrate. LMD even makes it possible to create multi-layer workpieces which, if desired, can comprise several different bonded alloys. Laser metal deposition (LMD) makes it possible to create multi-layer workpieces which, if need be, may comprise differing alloys which are bonded one with another. The additive processes described here are already available today and in the coming years may be on par with conventional processes from an economic point of view. They can, by the way, also be used to apply structural reinforcements or additional structures to workpieces manufactured with other techniques. This adds flexibility to production processes in regard to the placement, geometry and size of the supplementary structure. And since additional material is attached only wherever it is really necessary, this technique once against saves weight in the finished part. But even the processes introduced up to this point by no means exhaust the options for using laser technology in vehicle engineering. Rather, they form the basis for numerous novel concepts. Only a single example is described at this juncture. Remote fillet welding makes it possible to weld two workpieces at an overlapped seam. When compared with the laser welding normally used today, the amount of material can be further reduced by shortening the flanges in the overlapping zone. 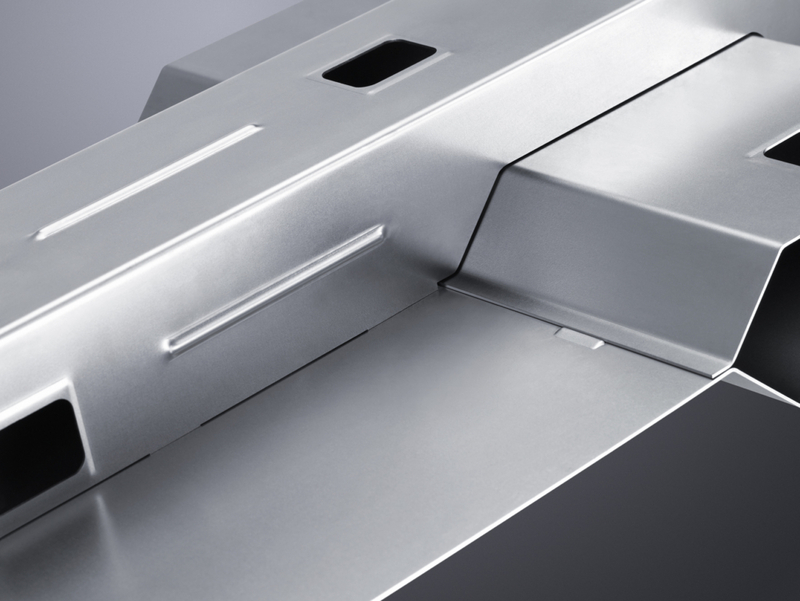 The seam is then welded by the laser beam direct in the fillet created here, requiring no additional filler material. One example of an application is welding seams in the frames for vehicle doors. This process does, however, require the highest positioning accuracy for the laser beam. This can be achieved by using appropriate sensors to register the orientation of the workpiece and continuously re-regulate the position of the laser beam. To summarize, laser-based processes make it possible to produce vehicle bodies with lower weights and to do so in different ways. This makes laser processing an important advance along the way to reducing emission levels, increasing cruising ranges and beyond this, to speed up, reduce the costs for, and add flexibility to automotive production. Ralf Kimmel is with TRUMPF Laser- und Systemtechnik GmbH.